4th of July weekend is around the corner and I can't think of a better way to celebrate the holiday than with fresh grilled local veggies, thick cut tomatoes, and juicy peaches! What's more patriotic than eating locally grown fruits and veggies? Featured Produce: Fresh Cut Herbs! It's peak vegetable season. One of the best way to flavor up all of the fresh produce you can get at the market is with fresh cut herbs. Many of our vendors have great selections of these and more exotic cut herbs available at market. Try something new this week! Get to know your produce and your farmers with a market scavenger hunt! For the next two weeks at the Community Farmers Market we will be providing short and easy to complete scavenger hunt sheets to be completed at the market. This is a great way to engage you kids at the market, to teach them about new foods, and to get to know your farmers! Scavenger hunts can be picked up at the Market Information Table on market day. Return your completed scavenger hunt sheets to the market information table to be entered for a market drawing at the end of the season. Do you Instagram? Photo catalogue your responses via Instagram by tagging #marketscavengerhunt @carbondalemarket. Swiss chard is known for it's large, dark, glossy leaves. It is a close relative to beets and spinach and has a mild flavor that is subtly sweet with earthy undertones similar to beet greens. Though lesser know, chard is every bit as vertical as it's cousin spinach and can be used place of spinach in most of your favorite recipes. Chard, unlike spinach, is available summer through late fall and into the winter. Chard stems can come in a variety of colors including electric red, light pink, bright orange and pale green and add a great pop of color to any dish! Nutrition Fun Facts: Swiss chard is an excellent source of minerals such as calcium, potassium, and magnesium! Together, these three minerals target the muscles to ensure proper maintenance, fluid retention, and contraction occurs. (2) Chard also has been linked to blood sugar regulation by helping regenerate cells in the pancreas (3). · Dipping sauce: peanut sauce, thinned pesto, vinaigrette, goddess dressing, etc. 1. Chop off the stems of the swiss chard at the point where it meets the leaf. 2. Chop the cauliflower into small pieces and pulse them in a food processor until it looks like rice. 3. Place the olive oil in a sauté pan over medium-high heat. Once the pan is hot, add the garlic and let it fry for about a minute or two, or until the garlic starts to brown. Add the pulsed cauliflower rice and cook it for about 2-3 minutes. Add a pinch of salt and chopped basil to the cauliflower and stir. 5. To assemble the wraps, place a large leaf flat down. 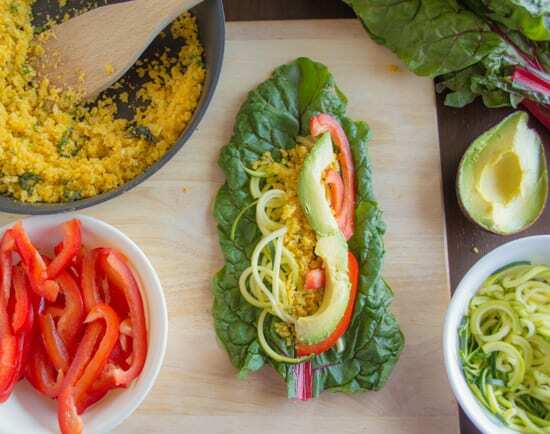 Add sautéed cauliflower, zucchini noodles, red pepper, and avocado along the swiss chard stalk and optional protein and fold chard leaf to create a wrap. 3. Stephens, James. “Swiss Chard-Beta vulgaris.” University of Florida IFAS Extension. < https://edis.ifas.ufl.edu/mv143>. Zucchini is the most popular of the summer squash family and grows rapidly during warm seasons. It is an extremely versatile vegetable that helps add moisture and color to recipes. Zucchini is a low calorie replacement for pasta in a number of dishes from lasagna to Asian ‘zucchini’ noodles with peanut sauce. The possibilities are endless really, why stop at zucchini bread? Preparation Tips: Zucchini is incredibly versatile; it can be baked, boiled, broiled, deep-fried, grated, grilled, marinated, pan-roasted, consumed raw, sautéed, shaved, steamed, stir-fried, stuffed and of course turned into zucchini bread. The zucchini plant also produces an edible blossom that can be battered and fried. A summertime favorite preparation is grilled zucchini. Slice small to medium zucchinis length wise into quarter inch strips, toss with oil, salt, and pepper and toss on the grill. These are a great as a side or on a sandwich. Cut the zucchini into ribbons using a vegetable peeler. Hold the zucchini firmly at the tip and draw the peeler down. Transfer the ribbons to a large bowl. Toss ribbons with oil, salt and pepper. Add in sun-dried tomato, goat cheese, and chopped chives and serve. 1.) “Dietary fiber: Essential for a healthy diet.” The Mayo Clinic. <http://www.mayoclinic.org/healthy-lifestyle/nutrition-and-healthy-eating/indepth/fiber/art 20043983>. 2.) “Zucchini and Summer Squash.” The University of Maine. <http://umaine.edu/publications/4257e/>. Cabbage is a versital all seasons vegetable. It can planted early in the season and harvested for summer salads, or late in the fall and stored for winter stews and soups. Coleslaw is a staple at many summer picnics and BBQ’s, however, cabbage salads need not be drenched in mayo to be good. Try this week’s recipe for Rainbow Cabbage Slaw for a unique twist of the summer classic! Nutrition Fun Facts: Cabbage (and it’s relatives broccoli, cauliflower, kale, etc) contain high qualities of powerful antioxidants that produce enzymes that help the body detox. Regularly consuming vegetables in the cabbage family can lower levels of ‘bad cholesterol’ in the blood and reduce the risk of heart disease. It is an excellent source of fiber, B6, folate and other vitamins that regulate heart rate and blood pressure. Storage tips: Keep cabbage cool by storing in a loose plastic bag in the crisper of your fridge. Partial heads can be wrapped with plastic and returned to the fridge. Cabbage is a traffic storage crop and can last for weeks or months in cool environments. Once cut, cabbage begins to loose vitamin C content so use cut heads within several days for maximum nutrition. Preparation tips: Cabbage can be eaten raw and cooked. Raw cabbage can be cut into wedges and then into large pieces and dipped in salad dressing for a healthy snack. Thinly slice or shred for slaws or salads. Shredded cabbage is a great topper for tacos, in spring rolls, or as a crunch side salad base. Steaming cabbage brings out a different set of nutritional properties. Whole cabbage leaves can be steamed or boiled until pliable, stuffed with ground meat or rice and vegetables. Thick sliced cabbage can be added to soups and stews and is very tender once cooked down. 2. In a separate bowl, add vinegar, ginger, sambal, salt, pepper and Dijon mustard. Blend until well combined. Pour over reserved salad and stir well. 3. Serve immediately, or refrigerate for a few hours to allow flavors to develop. 4. This salad will keep for 2-3 days in the refrigerator.